FPS Series 2000 and 3000 Race Hose is manufactured to the highest aerospace-quality standard for years of trouble-free service even in the most demanding circumstances. 500-1500 psi. working pressure covers all of the oil, water and fuel systems you may encounter. 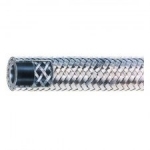 Two layers of rugged woven stainless steel.Inner layer resists collapse and the outer layer protect against abrasion.Unique CPFE inner liner is compatible with all hydrocarbon and alcohol based fuels, along with synthetic and natural based lubricants. 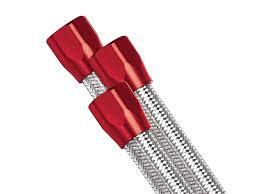 Operating range of –40° F to +300° F.Designed to be used with FPS Series 3000 “billet” swivel Hose Ends. As a rule of thumb when selecting an A-N hose to replace a given size automotive hose, the dash size is the nominal size in 1/16”.